I intend to update this page whenever occasion arises, so please check back from time to time. Thank you! Born in 1965 in Toyama prefecture, Japan I grew up in a mountain cottage that my parents ran in the Tateyama region of the Northern Alps, doing nothing but skiing all the time as a kid. Since skiing is a physical activity that requires the skillful handling of the equipment I was inevitably gravitated to that side of the sport, and my study room turned into a workshop of sorts. When I was in junior high school I took away the guitar that my sister bought from her and started playing it. However, I became more attracted to its structure, construction and so on, and tended to look at the instrument as a tool. And after entering high school I came across a book on guitar repairs written by Hideo Kamimoto, which was a rare kind around then. This was the book that led me down the path of guitar building in the first place. Fortunately my work started to receive due attention around 1998 after I ventured on a new approach derived from classic guitar builders such as a Spanish neck joint construction and so on. 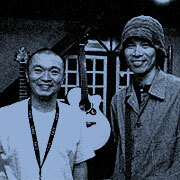 Soon after, guitarists like Isato Nakagawa and Satoshi Gogo started to spread the good word around by playing my guitars. In 2002 I attended a series of seminars conducted by Ervin V Somogyi. Although it happened to fall at a rather hectic time for me, the experience was eye-opening and well worth it. The main subjects of the week-long sessions were related to both the ideal way of putting the top part together and the way of approaching it in a methodical manner, which gave me a crucial insight for my views. Looking back, I think the experience helped me become more aware of the mental side of guitar building and also helped me discover the best course of action as a builder. In this regard, I am forever grateful to Mr. Somogyi and my aforementioned mentor Mr. Chai for their priceless insight. With Mr. Somogyi’s words of wisdom in mind, I have been active ever since, and I pay more attention to the guitar neck these days. The kind of interesting material I have discovered recently is beta-titanium that I use for a truss rod. You cannot tell just looking at the neck but it is light, springy and just perfect for the neck. If I say so myself, the unique use of this particular material is one of the features of my guitars. In 2003 I hooked up with Mr. Shinji Fujio, a designer based in Osaka. 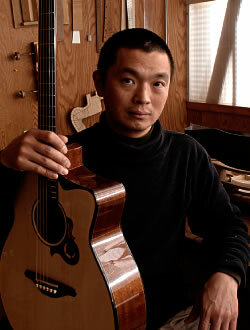 I got to know him through Dolphin Guitars (also based in Osaka) and it was them that put forward the idea of collaborating with me on a new model called "Dolphin I". And Mr. Fujio was the designer of this particular model. I saw a lot of potential in working with him as a team and we started to move forward with some projects. After repeated discussions and experiments we came up with two more models — "Carrera" in 2005 and "Dolphin II" in 2006 — as the result of our artistic exchange. In 2007 I made a fresh start by changing my brand name to SUGITA KENJI in order to put more of myself into the whole thing and to reflect my dedication to my guitars deeper than before. With "Carrera" as my main model I promised myself to make further efforts in paying meticulous attention to details. In early 2008 I came up with my latest model "Carrera O-14". Its small body of 13.3" makes it very playable, and in spite of the size, it produces enough sound volume. I am going to add another scale model (25.3") to the "Carrera D" series soon. Along with three members of my staff I keep myself busy building guitars and running the mountain cottage that I took over from my parents during the three months of summer. I feel that placing me in the vast stage of nature is a big plus mentally and physically, and above all it contributes a lot to generating renewed energy for guitar building.